Tentacles -- boneless appendages that serve some prehensile or tactile purpose -- appear in handful of animal lineages in the sea and on land. Vertebrates and invertebrates have tentacles. Among these differing kinds of animals, tentacles perform a variety of roles, including hunting and sensing. When most people hear the word "tentacle," the first animal they think of is probably a cephalopod. Cephalopods are a group of mollusks -- the same family as shellfish and snails -- that includes octopus, squid and cuttlefish. The family also includes the extinct belemite and ammonites. All members of this family have arms, but only squid and cuttlefish have tentacles. The tentacles are distinguishable from arms because they are longer, retractable and have a flattened/spade-shaped tip. Cephalopods with arms use them for hunting prey. Another group of mollusks with tentacles is the gastropods -- snails and slugs. Most snails and slugs have four tentacles on their heads. Two of these tentacles are eyestalks, appendages that end in an eye. The other pair serves to detect chemicals. It's a kind of enhanced sense of smell. Using this sense of smell and touch, the lower tentacles promote navigation. Cnadrians are another group of sea animals that have tentacles. This phylum includes jellyfish, sea anemones and coral. 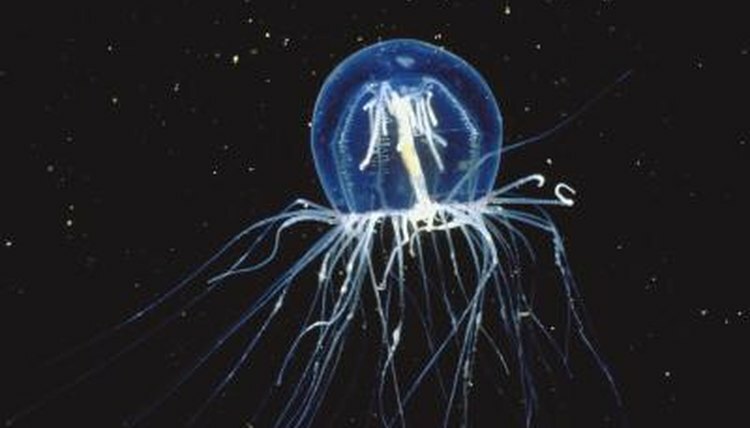 Two basic body types exist in this phylum, medusae and polyps. A medusa floats in the water column, with tentacles hanging down from its body in a ring around its mouth. Jellyfish have this body type. The polyp is like an upside-down medusa, with its body anchored down and its tentacles and mouth pointed upward. Anemones and coral follow this body plan. All cndarians have stinging cells called nematocytes that they use to envenomate prey or protect themselves. Caecilians look like snakes or eels but are actually amphibians. They are found worldwide but tend to live underground and are rarely seen. Some species have two tentacles on their heads. These tentacles are sensory structures. The caecilians use these to navigate underground and under water. They also use them to hunt for their prey, which includes worms and insects. The star-nosed mole (Condylura cristata) is a small mammal that has tentacles on its face. This mole lives in North America. It has 22 tentacles on its nose, each 1 millimeter to 4 millimeters long. Each tentacle has 25,000 touch receptors called Eimer's organs. These give the star-nosed mole the best sense of touch of any mammal. It can sense microscopic variations in texture. It uses these tentacles to navigate underground and hunt for food, much like the caecilians.